On the shoreline immediately below Puʻukohola Heiau, a famous temple built by Kamehameha I, is Spencer Beach Park. The park was named in honor of Samuel Mahuka Spencer, who served as the Big Island's county chairman, the equivalent of the present position of mayor, for twenty years from 1924 to 1944. Born in Waimea in 1875, Spencer was named after Samuel Mahuka, an uncle who raised him. After graduating from the The Kamehameha Schools for Boys in 1893, he held a number of government positions until his election as county chairman in 1924. Spencer died in Honokaʻa Hospital on February 28, 1960. 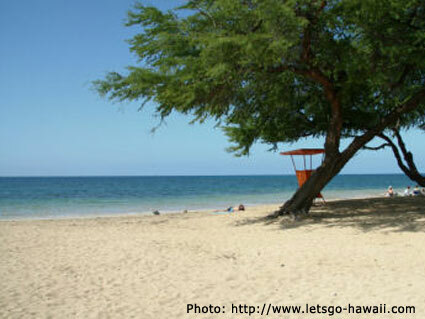 Spencer Beach Park centers on ʻOhaiʻula Beach, a large flat pocket of white sand with a very gentle underwater slope. A long shallow reef directly offshore and the extensive harbor landfill to the north provide good protection from the prevailing winds and offshore waves. Swimming, snorkeling, and skin diving opportunities are excellent. Hazardous conditions ordinarily occur only during severe storms. The protected beach and the facilities provided at the park have made it a very popular site, especially for families with little children. Facilities include restrooms, picnic tables, showers, tennis courts, a roofed pavilion, parking lots, a camping area, and a lifeguard tower. In the park are open grassy lawns, many large shade trees, and large population of birds, mostly mynahs and sparrows.